This weekend is the Autumn Equinox, when the hours of day and night are of equal length. It is a time in pagan Wheel of the Year to honour balance. Pagan rites will often call to the God of the Sun and the Goddess of the Moon, with a commonly held view that the divine masculine corresponds with solar energy and the divine feminine corresponds with lunar energy. But, of course, in reality that isn't always the case and there are plenty of sun goddesses and moon gods. Sun goddesses include Japan's Ama-Terasu; the Hesperides who are called "The Sunset Goddesses" in Greek mythology; Australian Gnowee, who holds the sun up as a torch in the sky each day to find her lost child; Catha, Etruscan goddess of the dawn and new beginnings; and Sulis, who was worshipped in England at Bath. There are even more moon gods than there are sun goddesses. They include Sin, from Mesopotamian mythology (who I named a cat after), Tsukiyomi, a Japanese moon god and brother to Ama-Terasu; Mani, the Norse moon god; Kidili, an Australian moon god; and Chandra, the Hindu god of the moon. 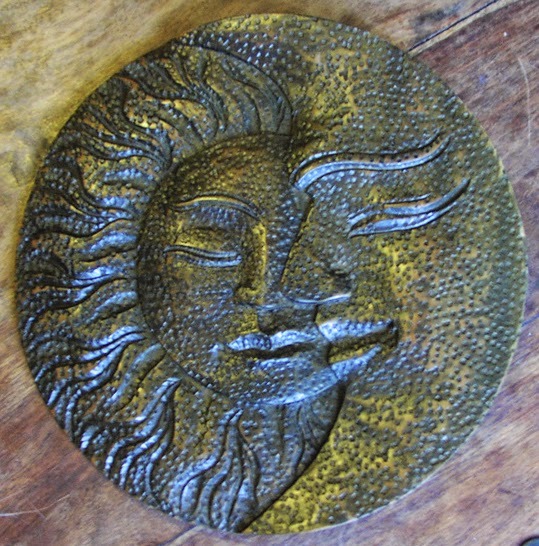 I saw the wooden plaque in the photo above in a charity shop a couple of weeks ago and felt that it was perfect to hang above my altar for this Autumn Equinox - the God of the Moon embracing the Goddess of the Sun, in balance, in harmony and in love.